Cottage par le Pass offre tout le charme d'antan ainsi que toutes les commodités modernes. Cottage par le col est situé à quelques pas de la plage de sable blanc, sans route à traverser. À travers la rue est Pass Village et Boardwalk John. A l'intérieur, vous trouverez un studio spacieux dispose d'une cuisine complète, salle de séjour confortable, lit queen dans la zone de couchage et une grande salle de bain avec walk-in. Le chalet est équipé de WiFi et de la télévision par satellite. En dehors des portes françaises doubles nos invités apprécient le grand balcon privé qui offre une vue peek-a-boo du Golfe. Le balcon est d'env. 400 m², partiellement couverts pour permettre un spot de grande salle. Traversez la rue pour entendre la musique live au Bamboo Beach Bar & Grill, ou parcourir les boutiques de Pass Village de John. L'emplacement ne peut être battu. Allez à pied à de nombreux restaurants, bars, prenez le tramway pour aller à la plage ou prenez un court trajet en voiture pour rejoindre les nombreuses attractions locales, les musées, etc. S'il vous plaît également voir l'unité en bas de ce chalet sur la maison à l'extérieur # 3716148. La salle de bains grande vanité personnalisé. how to operate it.I was alone and not very happy.The weather was nice.The people downstairs were just great.They made my day.I got the first plane out on march7 even though I had until march16.I like to thank you for the experience.It was not a welcome that I was looking for. I should of taken my sons advice and not go. This studio is a little piece of heaven. It was better than expected. Perfect location for shopping, entertainment and beach. Walk to everything. Studio has everything you need very clean and well kept. Enjoyed the large upper back deck, and so did Murray our Goldendoodle, you can listen to the music from the Bamboo @John's Pass, peek a boo of gulf and evening sun to end your day. Cherie was the best. Check in a breeze and she really does care about making sure you have everything you need to make your stay enjoyable. She goes above and beyond. Exceeded anywhere we have ever stayed. Thanks Cherie, See you next year. I'm so glad you enjoyed your stay at the cottage and I'm glad Murray had a good time, too! Thanks for the nice review and information for future guests. Hope to see you again soon. This is a cute property. It's right across the street from Johns Pass, and right at the beach. A well appointed cottage, I loved the kitchen and it was well stocked for all your needs. The bed was comfortable. The bathroom could use a little update. Cherie was great to work with, and is very consientious about making you happy. The one thing we were not prepared for was the noise factor. The Bamboo Bar across the street plays loud music. It does quit playing at 9 o'clock during the week, and 10 on the weekends. If you want to be where all the action is, this is the place for you. Lots of restaurants and cute shops right across the street. Everything is within walking distance. Thanks for taking the time to write a nice review. I'm planning to renovate the bathroom later this year, so, it will be updated soon! Quaint and close to everything including free live music- ends at a reasonable hour so as not to distract evening quiet time. Cherie was very accommodating bringing us a heater when the fireplace stopped working. Thank you for the review. I'm so sorry the electric fireplace quit working during your stay. It has been replaced with a new one. Thank you for your understanding about something that was out of my control. 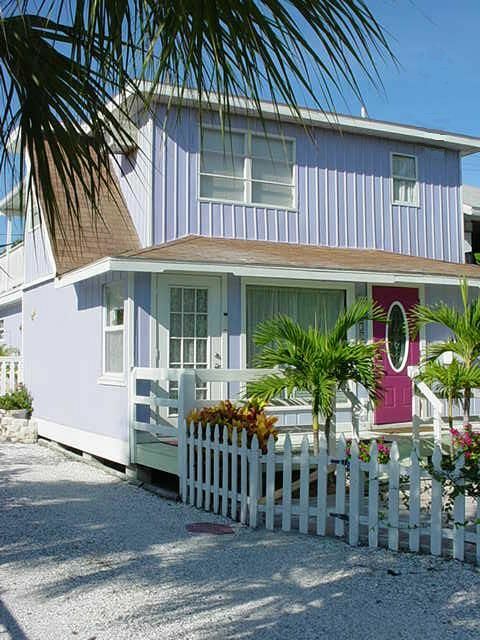 Great location, walking distance to johns pass boardwalk and the beaches. Unfortunately we were there when the red tide hit, but we didn't let that ruin our fun. We found a fun waterpark in the area since the beach and ocean weren't ideal with the red tide. If it wasn't for the heat, we would have been on the deck the entire time, loved it! Would highly recommend this place! Thank you for the 5-star rating. I really try to do all I can to make sure the cottage is a great place to stay. Unfortunately, the red tide affected your visit, but I'm so glad to made the best of it. I hope to see you again soon. The layout of the upstairs cottage was just the right size! It's an open floor plan which lets in amazing light. The walk across the street to John's Pass was super convenient. There really is a peekaboo view of the ocean. Very little can be seen but the large patio upstairs was very comfortable. So glad you enjoyed your stay and found the cottage to be a great place to visit. I hope you will come back again for another stay. Rates shown do not include 12% sales/lodging tax and one-time cleaning/departure fee of $85. $100.00 deposit required at time of reservation. Full payment due 30 days prior to arrival. After final payment, and/or 5-7 days before arrival instructions for entry with details will be sent.